After I. Wool, Y.-L. Chan and A. Gl.ck, in "Translational Control" (J.W.B. Hershey, M.B. Mathews and N. Sonen-berg, eds. ), pp. 685-732, CSHL Press, 1996.
some ribosomal proteins of Prokaryotes and Eukaryotes is given in Table 7.2 Rat and human ribosomes have 33 proteins in the 40S subunit (from Sa, S2, S3, S3a to S30) and 47 proteins in the 60S subunit (from P0, P1, P2, L3 to L41). Like in the case of E. coli ribosomes, the acidic proteins of the large subunit, P1 and P2, which are analogs of the bacterial L7/L12, are present in more than one copy per ribosome: both form homodimers, and the two dimers are combined together. It should be mentioned that at least 30 proteins of mammalian ribosomes display some sequence homology with eubacterial ribosomal proteins and thus can be correlated with corresponding E. coli proteins (Table 7.2)..
RP1 and RP2 are related to EcL12 indeed. Homologs of these acidic proteins of the large subunit are present in ribosomes of all studied organisms, both prokaryotic and eukaryotic ones. The primary structures of all the E. coli ribosomal proteins have been determined (Wittmann-Liebold, 1984). A comparison of the primary structures showed a lack of any sequence similarities: each ribosomal protein is unique by the criterion of its amino acid sequence, and no homologies between different ribosomal proteins have been detected. Thus the E. coli ribosome contains 52 different amino acid sequences possessing neither common blocks nor homologous regions. A similar conclusion can be made from analyses of amino acid sequences of ribosomal proteins of other eubacteria, archaebacteria and Eukaryotes. No general peculiarities of the primary structures of ribosomal proteins, compared with normal soluble globular proteins, have been found. Most sequences, however, contain a high number of lysine and ar-ginine residues which are sometimes clustered in lysine/arginine-rich blocks; this fact appears to be directly related to the RNA-binding properties of ribosomal proteins and results in the net positive charge of their molecules. Many ribosomal proteins do not contain tryptophan. Figure 7.3. Ribbon diagram of the structure of ribosomal protein L7/L12. 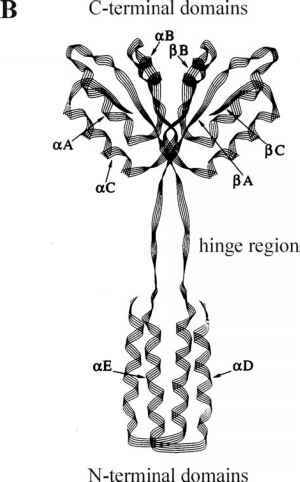 A: The structure of the globular C-terminal domain of the protein, as determined by X-ray crystallography (M. Leijonmarck, S. Eriksson & A. Liljas, Nature 286, 824-826, 1980; A. Liljas, Prog. Biophys. Molec. Biol. 40, 161-228, 1982). B: The L7/L12 dimer structure, as determined by NMR spectroscopy analysis in solution (from E.V. Bocharov, A.T. Gudkov & A.S. Arseniev, FEBS Lett. 379, 291294, 1996; reproduced with permission). Several eukaryotic ribosomal proteins are phosphorylated at serine residues. These are, first of all, the acidic proteins P0, P1 and P2. The phosphorylation is stable, i.e. unaffected by physiological changes, and necessary for the ribosome assembly and function. Another phosphorylated protein is eukaryotic S6 where several seryl residues are clustered at the C-terminus and can be targets for different kinases in response to different physiological stimuli. This is the case of changeable phosphorylation. The phosphor-ylation of protein S6 does not seem to be a prerequisite for ribosome assembly or function. Like in the case of acetylation of N-terminal serine of prokaryotic protein L12, the functional significance of this variable modification of protein S6 is unknown. As already mentioned, the primary structures of ribosomal proteins are very conservative in evolution. Proteins of rat and human ribosomes are either fully identical (32 proteins), or differ just in several amino acid residues per chain the identity varying from 90 to 100 %. This suggests that ribosomal proteins of all mammals are almost identical. There is an extensive homology of amino acid sequences between the equivalent ribosomal proteins of two taxonomically distant groups of eubacteria, gram-negative (Es-cherichia) and gram-positive (Bacillus); as a rule, at least 50% of the amino acid residues in the polypep-tide chains of corresponding proteins are identical. Similarly, considerable homology of amino acid sequences has been found for ribosomal proteins of various evolutionarily distant eukaryotic organisms; animals, higher plants, and fungi display 40 to 80% sequence identity between the equivalent ribosomal proteins. It is noteworthy that archebacteria (or archea) also show certain homology (from 20 to 50% identity) between their ribosomal proteins and the equivalent ribosomal proteins of eukaryotes, and somewhat less homology with the ribosomal proteins of eubacteria. Finally, some homology (from 20 to 30 % identity) can be detected between sequences of eubacterial (E. coli) and eukaryotic ribosomal proteins, including 15 proteins of the 30S and 16 proteins of the 50S subunit (Table 7.2). Returning to eukaryotic ribosomes, it can be stated that at least half of their ribosomal proteins have equivalents or homologs among prokaryotic ribosomal proteins, whereas others may be unique to Eukaryotes (see Wool et al., 1996). Generally, ribosomal proteins have compact, typical globular conformations with well-developed secondary and tertiary structures (Serdyuk et al., 1978; Ramakrishnan et al. 1981; Nierhaus et al., 1983). 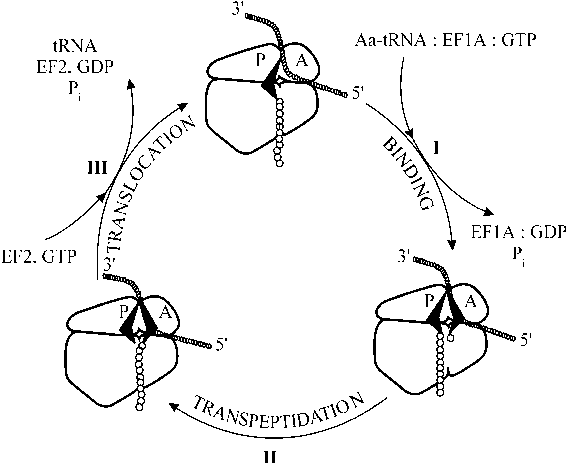 The conformations of ribosomal proteins in the ribosome are stabilized by interactions with RNA and other ribosomal proteins. When isolated from the ribosome, many ribosomal proteins are not stable and can be easily denatured. That is why physical studies of isolated ribosomal proteins, and especially their crystallization and X-ray analyses, are performed mostly with the proteins of thermophilic organisms, such as Bacillus stearothermophilus and Thermus thermophilus, that are characterized by increased stabilities of their three-dimensional structures. At the same time, at least some ribosomal proteins may possess noncompact "tails". For example, the E. coli protein S6 possesses a strongly acidic C-terminal sequence containing several glutamic acid residues added at the end post-translationally; it is unlikely that this sequence is included in the globular part of this protein. Protein S7 is also a typical compact globular protein with developed secondary and tertiary structures, but in E. coli strain K it has an additional sequence at the C-end, which does not seem to be an indispensable part of the globular structure. The acidic protein L7/L12 has a number of distinctive features. 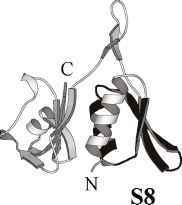 It has already been pointed out that this protein appears to form a tetramer in the ribosome. In solution it is stable in the dimeric form (Moeller et al., 1972). The dimers appear to be packaged in the tetramer which participate in the formation of a rodlike stalk of the large ribosomal subunit (see Chapter 5). The monomeric subunit of the L7/L12 protein consists of two domains: the globular C-terminal one with about 70 to 80 amino acid residues, and the non-globular, purely helical N-terminal one with approximately 40 amino acid residues; they are connected by an easily cleavable hinge. The globular domain of the E. coli L7/L12 protein (fragment 47-120) was the first protein element of the ribosome to be crystallized and studied by X-ray analysis. Its three-dimensional structure has been solved at a 1.7 A level of resolution. The secondary structure of the domain includes a-helices and b-sheets; their sequences along the polypeptide chain is as follows: paabap. The general pattern of folding can be presented as the globule composed of two layers: three a-helices are arranged into one sheet while the antiparallel b-structure consisting of three strands forms the other sheet (Fig. 7.3 A). More recently the whole structure of the L7/L12 dimer was resolved by using NMR approach. The arrangement of momomers is parallel. Two globular domains are in a weak contact with each other, if any. The monomers are firmly joined together by their N-terminal parts. The two a-helical N-terminal parts form four-helix antiparallel bundle, as shown in Fig. 7.3 B. The N-terminal part of the dimer is responsible for interaction with protein L10 and integration with the ribosome, whereas the globular domains possess a mobility relative to the rest of the ribosome, being hung on flexible hinges. It is not clear yet how two dim-ers are arranged in tetremer. Protein S6 from Thermus thermophilus (M. Lindahl, L.A. Svensson, A. Liljas, S.E. Sedelnikiva, I.A. Eliseikina, N.P. Fomenkova, N. Nevskaya, S.N. Nikonov, M.B. Garber, T.A. Muranova, A.I. Rykonova & R. Amons, EMBO J. 13, 1249-1254, 1994). Protein S5 from Bacillus stearothermophilus (V. Ramakrishnan & S.W. White, Nature 358, 768-771, 1992). 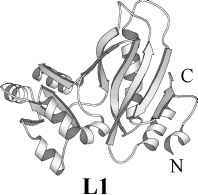 Protein L1 from Thermus thermophilus (S. Nikonov, N. Nevskaya, I. Eliseikina, N. Fomenkova, A. Nikulin, N. Ossina, M. Garber, B.-H. Jonsson, C. Briand, S. Al-Karadaghi, A. Svensson, A. Aevarsson & A. Liljas, EMBO J. 15, 1350-1359, 1996). Protein S8 from Thermus thermophilus (N. Nevskaya, S. Tishchenko, A. Nikulin, S. Al-Karadaghi, A. Liljas, B. Ehresmann, C. Ehresmann, M. Garber & S. Nikonov, J. Mol. Biol. 279, 233-244, 1998). (Protein S8 from Bacillus stearothermophilus has a very similar structure: C. Davies, V. Ramakrishnan & S.W. White, Structure 4, 1093-1104, 1996). of S5 has some similarities to that of domain IV of EF-G (see Fig. 12.2). Protein L1 is also a two-domain protein; its RNA-binding domain is composed of two layers where two a-helices lie on four-strand ß-sheet. It is beleived that the ß-sheet, and specifically its middle strands with their basic and aromatic amino acid residues, takes an important part in RNA recognition and binding. Another two-domain protein - S8 -has the N-terminal domain (aßaßß) where the three-strand ß-sheet lies on the two a-helices and is exposed for the interaction with RNA; the C-terminal domain of protein S8 has an unusual, mainly ß-sheet conformation. Five-ß-strand barrel structure is another folding motif spread among ribosomal proteins. The representative is bacterial proteins S17 (Fig. 7.5 left). Protein S17 is an RNA-binding protein and extensively interacts with ribosomal RNA. The same folding motif is known to occur among cytoplasmic mRNA-binding and nuclear hnRNA-binding proteins in Eukaryotes. Actually the ß-barrel proteins can also be presented as two-layer globules where one ß-sheet lies on the other, with RNA-binding site at one of them. Long flexible loops between the strands are likely participants of RNA-binding as well. On the other hand, fully a-helical proteins, e.g. protein S15 (Fig. 7.5 right), can occur among RNA-binding ribosomal proteins. a-Helical protein S15 from Thermus thermophilus (H. Berglund, A. Rak, A. Serganov, M. Garber & T. H%„rd, Nature Structural Biol. 4, 20-23, 1997). A relatively mild technique for dissociating ribosomal proteins from the ribosome includes treatment with monovalent salts such as CsCl, LiCl, or NH4Cl at high concentrations. As a result of such treatment, many proteins dissociate in groups rather than as individual molecules. This reflects a certain cooperativity of protein retention within ribosomal subunits. In a number of cases such groups of proteins may be removed from the particles as stable complexes. A pentamer formed by one molecule of protein L10 and the tetram-er of protein L7/L12 is an example of such a stable complex of bacterial (E. coli) ribosomes. It can be selectively removed from the 50S ribosomal subunit by treatment with 1:1 mixture of 1M NH4Cl and ethanol. As a result, the 50S subunit loses its stalk. Globular structures of both protein L10 and protein L7/ L12 within the complex are markedly more stable than in the individual state. The pentameric complex may be loosely associated with yet another protein, L11. Similarly, the pentameric complex P0:P12:P22 of acidic ribosomal proteins is revealed in eukaryo-tic ribosomes and can be selectively removed from the 60S subunit resulting in the loss of its stalk (rodlike protuberance).